One of the many reasons why people start using software like Amped FIVE is that it installs and runs on any modern Windows PC. There is no need to have huge amounts of hardware or specific configurations. A good, stable setup will work perfectly well. One of the key purchasing decisions though, when updating or designing a new workstation is the monitor. 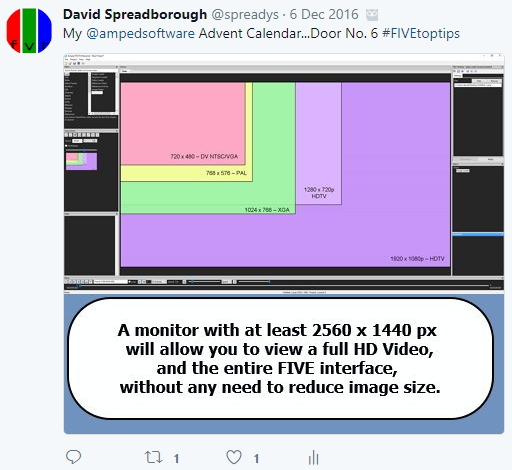 Some of you may remember that I briefly mentioned monitors in last year’s Advent Calendar: useful tips and tricks in Amped FIVE blog post. 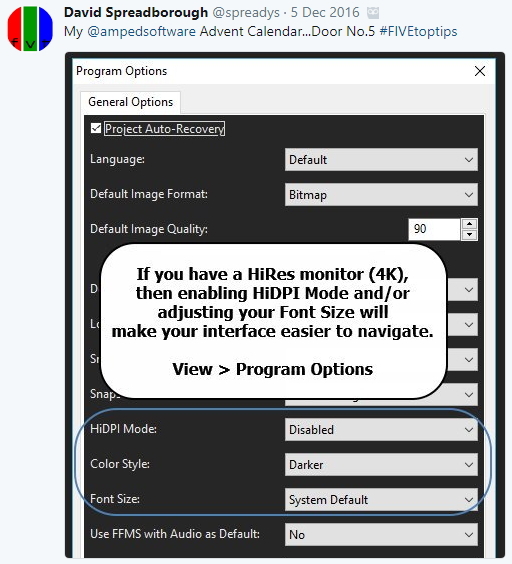 We also deal with 4K High DPI Monitors by giving you various, dedicated program options. The first thing to look for then is the screen type. Although IPS (In-Plane Switching) has been around for a few years, it has now become the buzz word of screen technology. The reason behind this is that IPS monitors have a greater contrast and color reproduction. For size, I personally believe that 27″ (QHD) is an ideal choice. I have seen a few 24″ (UHD) set ups and they are also good. Although HD -1920px x 1080px is the must for laptops, for the desktop, I really think that you need the screen space that a larger resolution allows you. For proprietary players, an open PDF, or Amped FIVE, a nice big screen helps to see everything together and assists with productivity. So, we have the screen type and size, but what about other technical specifications? It’s very difficult to give a definite answer to this as there are no standards for how manufacturers display some of this information. Therefore, if you narrow your searches to a number of manufacturer / models and then read the reviews of those, you should be able to assess their suitability. There is a great guide over at Color-Management specifically on buying monitors. For a few years, I have been using the Acer CB270HU. This was color calibrated with a Datacolor Spyder. There are some monitors that now have color calibration built in, such as the Eizo CG277 27-Inch IPS LED Self Calibrating LED Monitor. One of the best I have seen recently was this one from BenQ – BenQ SW2700PT 27-inch 2K QHD Photographer Monitor. Many people seem to be using Dell screens, such as these: Dell Ultrasharp UP2716D. If you are curious about the Amped R&D team, they use different versions of the Dell U2715. Gabriele, who is a color space nut, uses a NEC P232W. If you have the proper hardware, this monitor can be driven at 10 bit. Martino recently bought a Dell U3415W. This monitor is so wide that it’s very difficult to realize if he’s in the office or not. It all comes down to understanding what you will be requiring in a monitor. As you are using it to view details in images, you require an accurate representation of those details. I hope that this small post has given you some ideas on monitor purchasing decisions, and perhaps highlighted that if you are being forced to view CCTV images on a poor monitor – it may not be suitable for the job! This entry was posted in Announcements on August 11, 2017 by David Spreadborough.